Christmas just isn't Christmas without the beautiful twinkle of fairy lights, transforming your home into a winter wonderland. 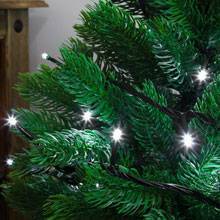 Here at Festive Lights, we have a number of different types of indoor Christmas lighting in a whole host of colours, styles and festive pizzazz to suit every decorative theme. If you’re also looking to create a grotto on your front lawn or to compete against the neighbours for the best display, we also have a huge range of outdoor Christmas lights ready for the winter season. 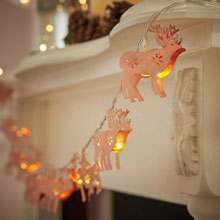 You mustn't forget your Christmas decorations too, browse our selection on the site today! The first thing anyone thinks of when they hear the word Christmas, other than the presents, the Christmas tree, eating way too much food and, of course, Father Christmas is transforming their homes into perfect winter wonderland grottos with indoor Christmas lights. There’s nothing more exciting than seeing all the homes in your local villages, towns and cities following a tradition that’s continued for generations and generations, all with different styles and taste to mix things up a little! 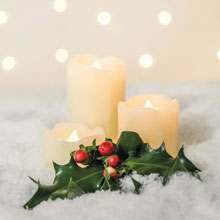 Historically, when wanting to decorate their homes and inject a little festive cheer, people would place real candles around the house and directly onto the Christmas tree. As beautiful as this was, it was clearly a fire safety hazard and of course, nowadays, we have the much safer alternative of the LED bulb to adorn our trees and mantelpieces, or if you fancy a mix of the two, of course, we have a huge variety of Battery LED Candles. There are so many indoor Christmas lights to choose from, with an abundance of different colours, designs and styles to suit every possible theme, you might, quite literally, be spoiled for choice! The most common form of indoor Christmas lights is, of course, the beloved fairy lights. 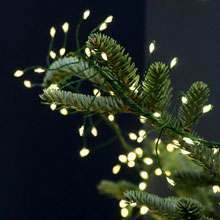 We have plenty available, alongside an amazing selection of tree lights and cluster lights too. So what’s it going to be? We’ve got all the lights you can think of when it comes to Christmas lighting, so why not take a chance on us. Indoor Christmas lights really bring home the Christmas spirit and create a beautiful surrounding throughout the festive season. Of course, as we mentioned before, the fun doesn’t stop here. Our range of Christmas lights stems from icicles to village scenes to app controlled lights and much more. Visit our Christmas lighting section here, today.